Harley-Davidson (NYSE:HOG) reported its Q2 and half-yearly results on July 28, and as has been the case for the last few quarters, retail sales declined in the U.S., which forms almost two-thirds the net shipments for the company. However, the bright spot for Harley was that it was able to gain market share in its domestic market. Harley was hit but the overall slow demand for heavyweight motorcycles in the U.S., especially in areas most hurt by the oil slump. Growing uncertainty regarding the country’s political climate, and global macroeconomic conditions, kept customers from purchasing these higher-end motorcycles. In a bid to protect its premium brand image and not let inventory stack up, Harley lowered its full-year guidance on motorcycle shipments to 264,000-269,000 units, down 1% to up 1% from 2015 levels. Stiff competition from foreign manufacturers, buoyed by the stronger U.S. dollar in the last year or so, hasn’t helped Harley’s case. The company will launch its 2017 model year motorcycles next month, and is stepping-up investments in marketing to boost its sales. Harley is increasing investment in customer-facing marketing in 2016 by approximately 65% above 2015 levels, and increasing investment in new product development by approximately 35% from 2015 levels. In dollar terms, this represents a $70 million increase from 2015 levels in investment by Harley, in a bid to raise brand awareness, grow ridership in the domestic market, and increase reach, and availability. 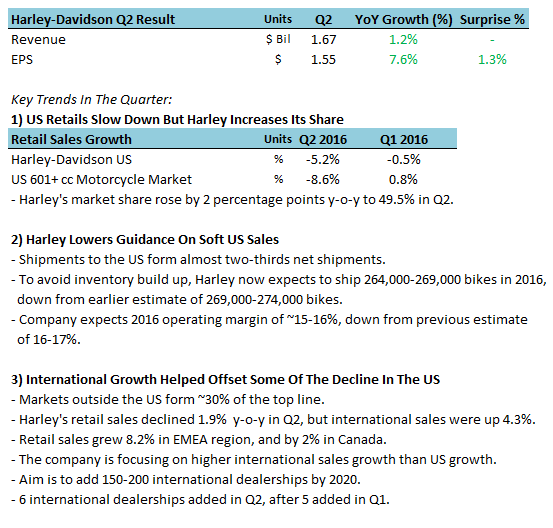 While retail sales have declined in the U.S. yet again this quarter, Harley has proven to be resilient in a market where its competitors have fared even worse this quarter.